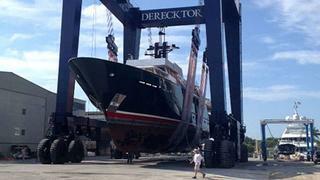 Derecktor Florida has recently started work on a significant refit to Feadship's classic 46m The Highlander. This iconic vessel, designed by the famous John Bannenberg and delivered by De Vries Scheepsbouw in 1986, was built for the equally iconic Malcolm Forbes of Forbes magazine. She has been purchased by an experienced yachtsman and his wife with the intent of restoring and updating the vessel, while retaining much of the distinctive Bannenberg profile that they love. In addition to a more contemporary stern extension, some modifications to the superstructure to better fit their intended use of the vessel and a full exterior paint job with the classic green hull for which the yacht is recognised, the interior will be completely re-furbished and all navigation systems updated. The work includes the addition of zero-speed stabilisation and installation of a modern Z-lift stern platform. Other projects include a completely new air-conditioning plant and updates to all the hotel systems. When completed, The Highlander will re-join the world's superyacht fleet, likely operating on the East Coast of the US and in the Mediterranean. 'Derecktor is proud to have been selected to assist in the restoration of this world-famous yacht,' said James Brewer, Derecktor's Sales & Marketing Manager.